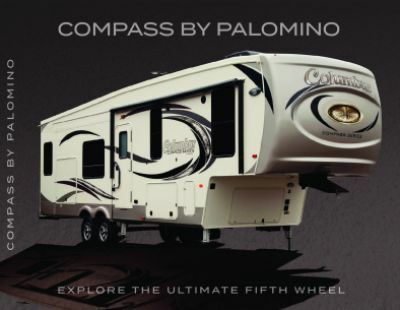 Visit every national and state park of your dreams with the 2018 Palomino Columbus Compass Series 374BHC 5th Wheel! Since 2008, National RV Detroit in Belleville, Michigan has been one of the country's top, full-service RV dealerships thanks to our huge selection of top RV brands and our unbeatable wholesale prices that will make you smile! Even if you don't live in the Belleville area, with our fast, reliable 24/7 delivery service anywhere in North America, you can visit us online, find your dream RV, and give us a call at 734-439-3400! You'll get your perfect RV delivered right to your door at a great price, and you'll be on the road in no time! Under the 16' 0" awning, your family will stay cool in the shade when they're outside! This RV has a hitch weight of 2357 lbs. and GVWR of 15785 lbs. Stretch out and enjoy the ample legroom inside this RV, which has a length of 42' 7", width of 8' 5", and a height of 12' 6", as well as 4 slides! The 35000 BTU furnace and the 15000 BTU a/c keep the interior nice and comfortable! You can enjoy clean drinking water and not load up a landfill with empty plastic water bottles, thanks to the 64 gallon fresh water tank! The roomy kitchen has a sink, 8.00 cu. ft. refrigerator, 3 burner range cooktop, and other great amenities! In the past, did you miss leisurely, hot showers when you were on the road? Or did you have to make that tedious trek through the campground to the cold, damp, messy community bathroom and then wait in line if you wanted a shower? 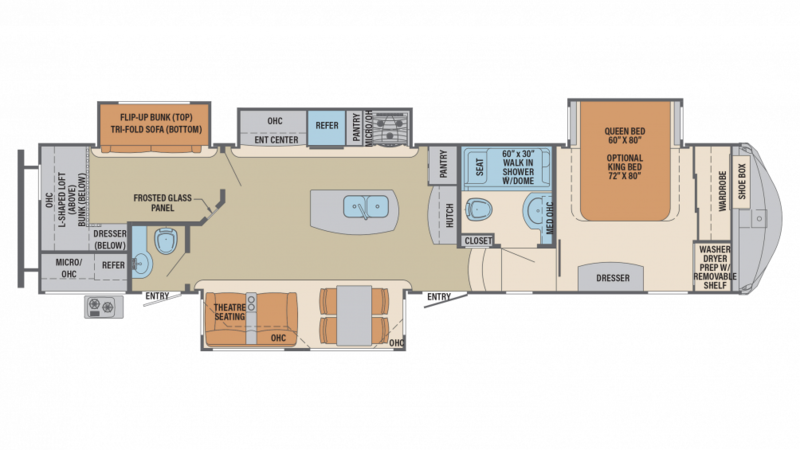 There's good news for you when you camp in the Palomino Columbus Compass Series 374BHC! It boasts a bathroom with a roomy shower as well as a handy Porcelain Foot Flush toilet! Comfort, convenience, and privacy, with plenty of clean, hot water thanks to the 64 gallon freshwater tank and 60 lbs. of LP tank capacity! Dirty water and waste are stored in the 71 gallon gray water tank and the 39 gallon black water tank, respectively. At the end of a long, full day of outdoor adventures, it always feels great to climb into a cozy comfortable bed and drift off to dreamland! That's what the whole family can enjoy in the Palomino Columbus Compass Series 374BHC, especially in the handsome bunkhouse! It's roomy and quiet and the kids will love it! Food made outdoors always tastes great, doesn't it? When you go camping in the 2018 Palomino Columbus Compass Series 374BHC, you can whip up great outdoor meals in the sunshine and fresh air, thanks to the handy outdoor kitchen!